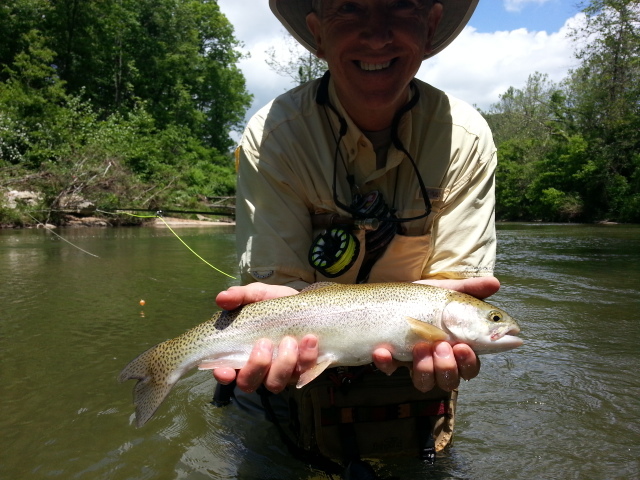 Wed. June 26, 2013…..Had another fantastic day yesterday in East Tn fishing the sulphur hatch which is coming off both the Watauga and the SoHo. Guided Dr Keith Clance and Dr. Pat Burney and we put about 40 fish in the net…..again all rising fish and all on dry flies. Have some new patterns I have been tweaking, developing, working on and we have done very well on them. On one of the prototype cripple patterns Pat landed almost 20 fish on it before it was toast. 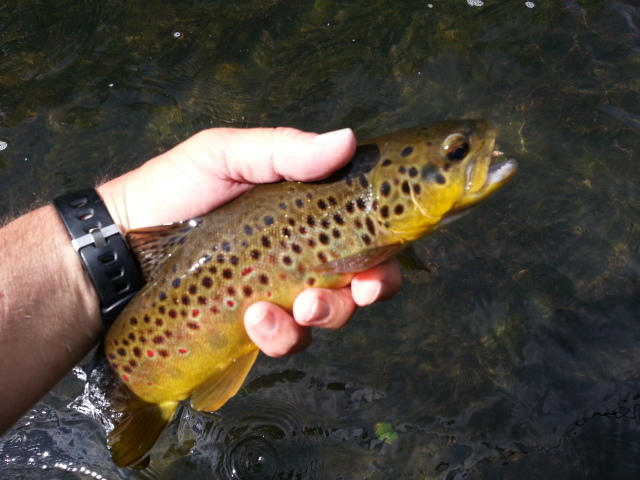 Not bad for a sparse delicate Soho selective trout dry fly…. Will be finishing up this afternoon and heading back to teach an evening session of my fly 101 class. Then another TN trip tomorrow with Jeff Chalmers of Summerfield, NC. Expecting another good day of dry fly action tomorrow. Have a great one…..more to come…. Great Hatch, Today is Catching…. Mon. June 24, 2013…..Another great day so far, well over 50 fish in the net, guiding Dr Bose Ravenel, Dr Ray Coble, Mike Meisky, and Mike Hedrick. Great post pulse hatch, all our fish rising and on dries…. Great Start to the Week…. Mon. June 24, 2013….Great start to the week guiding Mike Meisky, Dr Bose Ravenel, Dr Ray Coble, and Mike Hendrick…great morning hatch just as I was expecting…landed 25 fish by 10am and looks like its going to be a great day. Lots of folks fishing. With good wade schedules…hard to blame them. Sat. June 15, 2013…. Hope you are having a great weekend so far, we ended a great week…no, let me put it another way… stellar week of fishing on the TN tailwaters. The dry fly fishing has been unbelievable. Will be guiding over there all of next week and a good bit the rest of the summer. 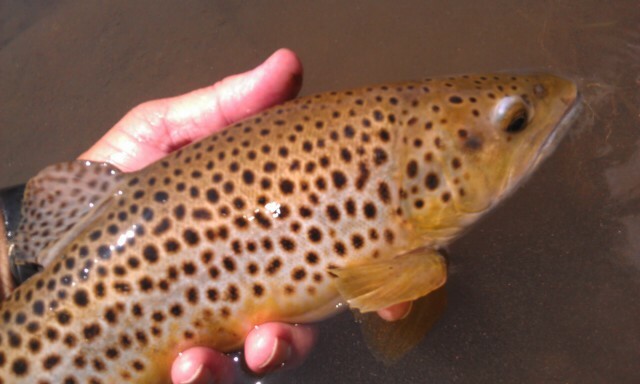 Who would believe we have some of the best dry fly fishing in America right in our backyard….pretty cool I’d say. Not too late to get a gift certificate for that special someone for Fathers Day. A gift certificate for a guided trip has been a hot item this year.. and they should be. Its a great gift, and one gift the person will always remember. Usually they take away some skills and knowledge that will help them in their fishing for the rest of their lives. Gifts that keep on giving…..I like that. Have a great weekend and Happy Father’s Day! Thurs. June 13, 2013….Very early start today, I guided Neal Mitchell in East TN amd with the threat of bad weather later in the day I wanted us to get the most out of our morning. It was a good call. Flies were popping off as soon as we got started. Sulphurs began coming off and soon many fish were rising all over the river. I put Neal on some pods of larger more mature fish and we did very well. Over 5 hours Neal landed 35 fish …a mix of browns and rainbows and all on dry flies. We caught all our fish on one of my new CDC cripple patterns. For a while every fish Neal covered, some of which were 16 to 18inch fish, ate it. Will be tying a pile of them for some upcoming fishing. We fished til mid afternoon until a severe thunderstorm ended our day. We headed home and I returned to find an 80 foot tall poplar tree toppled across my driveway and yard. Fortunately it missed the house …. Some pretty nasty storms…..on the river there were 70 to 80mph winds…. Will be doing another trip tomorrow guiding Dr David Spivey and his grandson Corbin. Should be a great day…..
Mid-Week Update……Fishing Has Been Stellar…! Tues. June 11, 2013……. “River right….over there. You see that ledge, where that dark or black edge meets the fine gravel and that little twig or stick is sticking up out of the water? The fish is right on the spot where the ledge and gravel meet. Its a nice fish, probably 18 or 19 inches”…. I said as my client and I crept in the two inches of flat water that lay in front of us. We got into position and my client pulled out just enough line to make a false cast, then a presentation to the large brown. “You think I should cast way ahead of the fish or close to him…?”….my client asked. “I’d go no more than a couple of feet ahead of him”….I explained. “I’d lead him by at least that much but not more because the fly will drag before it gets to him.” This fish, a wild, large , mature brown trout was rising to a steady parade of sulphurs that were already pouring off and floating on the river’s surface. We both watched the fish rise two more times so we were absolutely sure of its position. With the position in head, my client made one false cast then laid a near perfect presentation two feet ahead of the fish with just enough slack in the tippet that the fly floated nicely right to the fish. 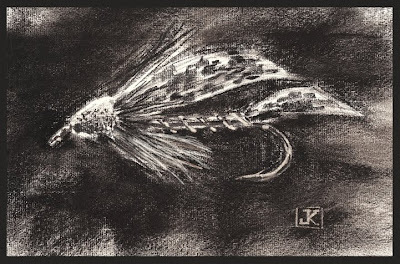 The fish, a prey to its own gluttony, did the look up, slow tilt up, and then slid ever so gently and precisely and took the fly in will barely so much as a splash….this is the way a large fish with lots of practice will do. “Whoosh….” the rod made a sweeping sound as my client abruptly but smoothly lifted the rod softly and connected with the fish. And about a minute and a half later a 19 inch male brown trout lay in my net….with one of my sulphur cripples still firmly planted right in the tip of his developing kype. It was a beautiful thing to watch…one as we saw the fish eat, two as I watched my client smoothly connect on the fish, three as I watched the fish come gliding to net… and four as we watched the beautiful male brown slide slowly back into his element….not defeated but definitely with his spirits dampened. And the best part? I get to watch this every summer when we stalk fish with dry flies. Sound like something that might interest you? Its just getting started. And I have some days available…..let’s go fishing…. A rare day at the office today after postponing today’s trip I had scheduled with one of my regular clients David Carter of Greensboro and his friend Rodney. We decided to give things a day or so to settle down and reschedule. We could have fished over in TN, and probably made a day of it, but the heavy rains and runoff stained opportunity everywhere else. So we are looking to another day. Its been mighty busy the past two weeks. Been murdering fish at Escatawba….that’s code for “catching them like crazy”….”banging fish”….”smokin’ em”, not literally murdering them….just for the record….Lol. 🙂 Its been great though, had a string of four days of unbelievable dry fly and small fly fishing at Escatawba/Dunlap Creek. We averaged 40 fish and one of the days topped the 50 mark. Caught probably 75 fish that were 20 inches or over. The kicker was that a bunch of those were on dry flies. HUGE dry flies. That’s like fishing in Montana or Wyoming….and we have it right here in our backyard. Here’s Adam Harman nailing a nice fish with a size 8 dry fly…. Also, we have been doing a ton of sight fishing…..something I love and something you’d love if you have never done it. There’s nothing like stalking a large fish, make a cast, see the fly, see the fly approach the fish, and see the fish tilt, focus, and glide over to take it in. There’s nothing like it….its absolutely unbelievable. And I can’t get enough of it…. 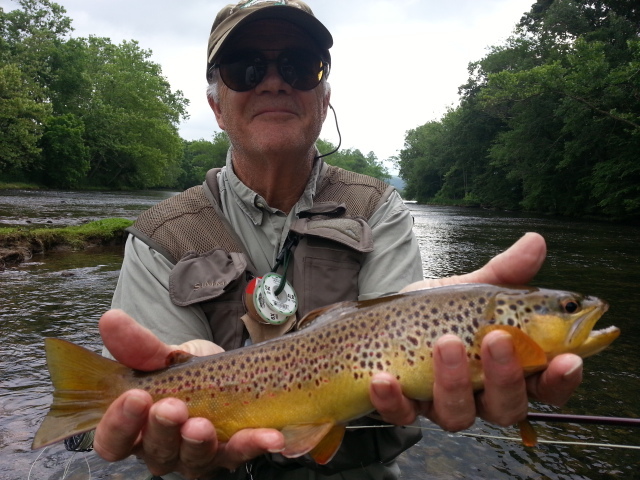 We also have been over in TN a lot , East TN on the South Holston, Watauga tailwaters and Laurel Fork, Roan Creek, Doe River, Doe Creek, and the Little Doe. Have done well on them all. But the most incredible fishing has been on the SoHo. Had some of the best dry fly fishing on a couple of occasions I have ever had anywhere. Had a 75 fish day with one client, Dr. Jim Kramer, who’s a former fly fishing class student and in the past 10 years has become a phenomenal fly angler. Not good, not really good, not excellent, not great…..Phenomenal. Jim and I stalked sippers on the SoHo and literally nailed one fish after another. Pick a large fish, watch it rise, measure out some line and make a cast to get line out, make one presentation and got ’em. We nailed one fish after another. It was almost as though you couldn’t miss. If a fish rose, and we were close enough to cover it, it was a done deal. The fish was going to eat the fly. No exception. Those days aren’t rare but they are unusual….and it was unbelievable. 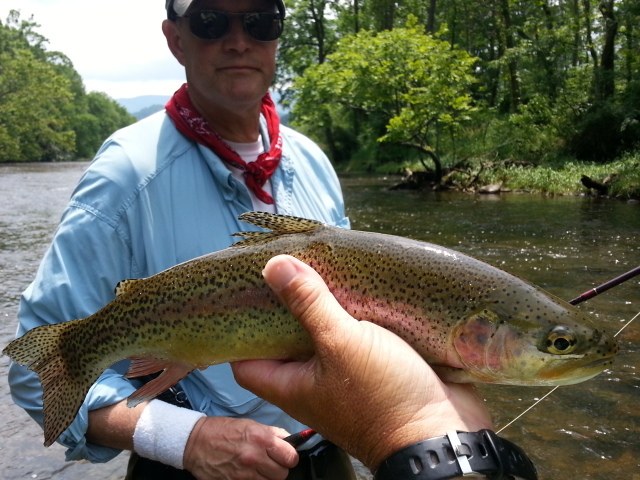 Here’s Jim nailing a rainbow 17″ that was steadily rising to the sulphur hatch and who ate it on the first good drift…. 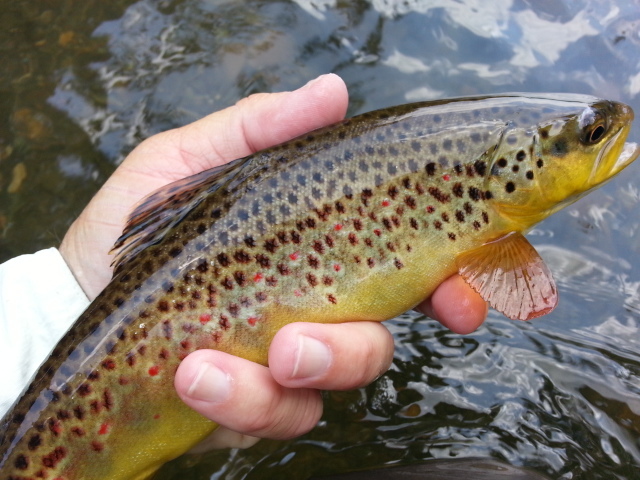 The hatch is going strong, as there are flies on a bunch of other nearby waters as well. Now is the time to cram the fly box full of yellow patterns—mayflies, caddis, stones, as well as terrestrials . If you aren’t catching fish and don’t have these flies that might be the reason. Tis the fish to fish something yellar (East TN pronunciation) or black. I have tons of these patterns, can fill any flies you need. You can get a lot of flies for fishing these situations, and most will catch fish. Our hatch match dries sell well because they work, work consistently, work on the tough and larger fish that won’t look at anything else…. I have an entire entourage of SoHo dries….dry flies,emergers, in the film patterns, cripples….and I can assure you and as many customers/clients will tell you…they work ‘magic’ on those fish. But they should, I’ve put over 25 years of daily fishing, tweaking, designing, tinkering, experimenting with patterns and materials to get them to that point. Some of those experimental flies I personally tied, tinkered, altered, changed, etc., right on the riverbank next to a run full of rising fish…some of them tied at the house and then I’d run down the hill to the river and try them out…. so a lot of R & D has gone into them. They catch fish…..not just fishermen. 336-944-3628 or jwflyfishing@gmail.com is your avenue to some great summer fly patterns…. I do tons of custom fly tying for clients…..and they are the flies I fish and guide with….I’d love to help! Also, as is common I trade ideas, flies, etc. “stuff” with other guides, writers, etc. in the fly fishing industry and that’s one great thing about our community…..its a free info sharing place..and folks are so generous with their ideas and knowledge. Friend, fellow fly angler, author of several fly fishing books and ORVIS Fly Fishing Development Coordinator Tom Rosenbauer used one of my videos in a piece this week he did on how to match the hatch and fishing to selectively rising wild trout…. 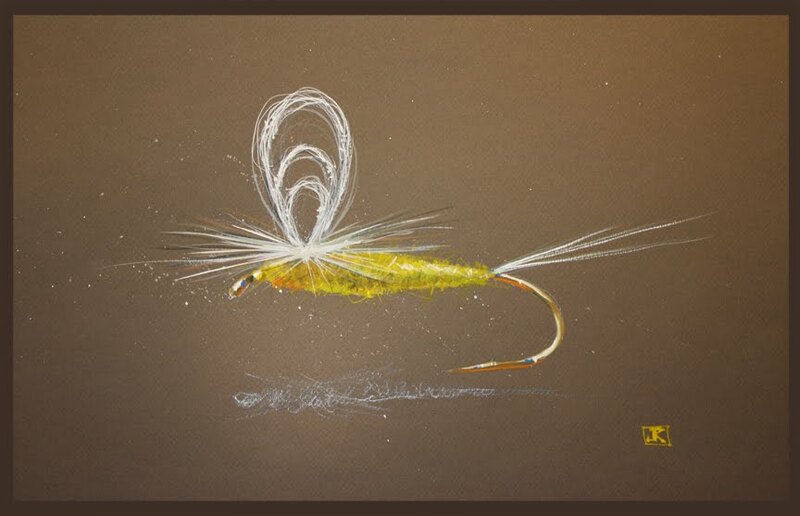 click here to view and read his piece that appeared on the ORVIS site and fly fishing blog. Tom is the author of The ORVIS Fly Fishing Guide, Reading Trout Streams, and many other fine books. Thanks Tom! Here is the video clip Tom used in the piece on Matching the Hatch…it is a clip of a large pod of wild, rising, South Holston brown trout feeding on a heavy sulphur hatch……this will get you ansty and wanting to make a cast…..Beware! We have an upcoming newsletter that I am feverishly working trying to get finished on. It will be packed full of info and other stuff. Summer is definitely here and so is some great fishing. Some of our best fishing of the year in many respects. Its been rainy and very wet….guess what that is? Normal. Its been hot and breezy. Guess what that is ? Normal. 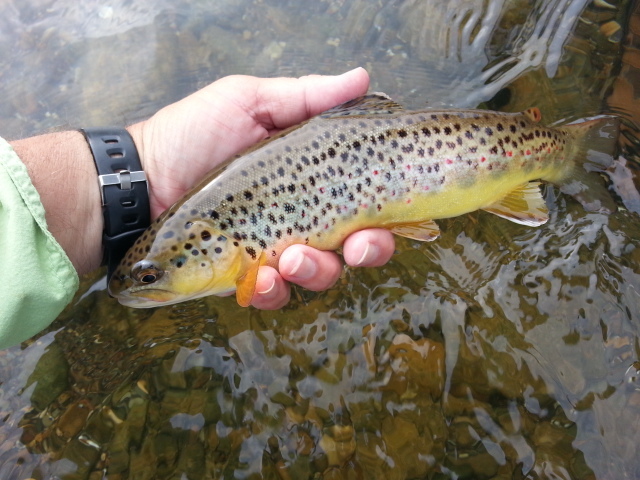 The dry fly fishing has been very good….incredible. That normally happens after a really wet period like we have been having since last year. Its been very wet. I am not an expert, but I suspect it has something to do with increased runoff, and that brings more nutrients, which grows more and more bugs, which means great hatches and fat and happy trout. I have seen that so many times in my almost 40 of my 46 years having fished for trout in almost every environment imaginable. I remember the last high water year we had and the resulting fishing the year or two afterward. I predict in ten years we’ll be talking about the dry fly years of 2013 and 2014. The sulphurs, stones, caddis , and terrestrials will come. I and many clients will follow. I have a few openings for July and early August before I head for Jackson Hole, Wyoming for several weeks to guide trips there……. Its going to be good…Lets Go Fishing….! 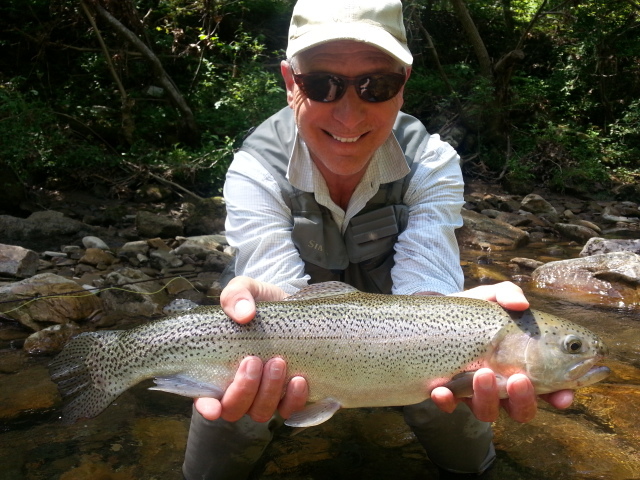 One of my favorite clients, Tom Ross, UNC University System President with one of many Mitchell Co, NC rainbows we landed in a recent trip there……..
Mon. June 10, 2013 …. An early start and what a great day even though the weather was pretty soggy . Guided Greg Adzima, High Point, NC, and we fished in all day on and off downpours. 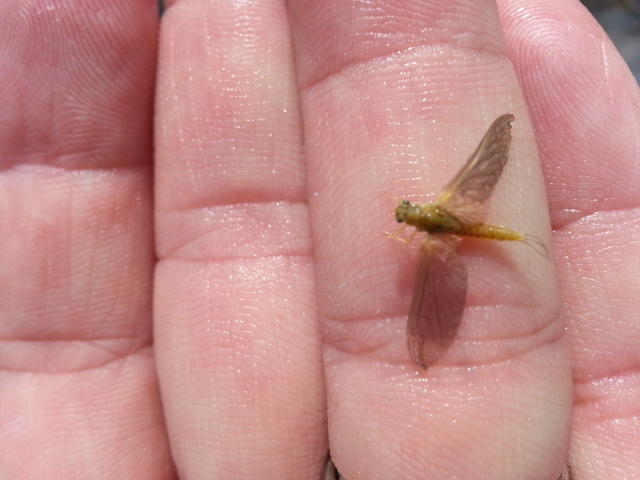 We got one heck of a midge hatch early, then bwo spinners, a few black caddis, and the grand finale the sulphur hatch. 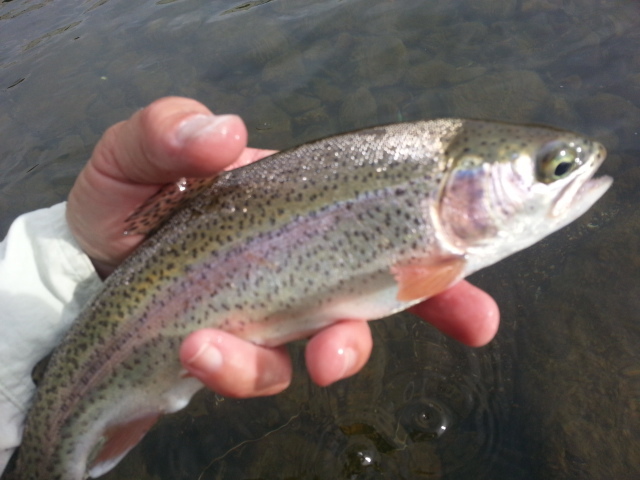 Greg landed about 30 fish, a mix of rainbows and browns and most of them on dry flies. We caught them on a variety of dry flies and emergers. 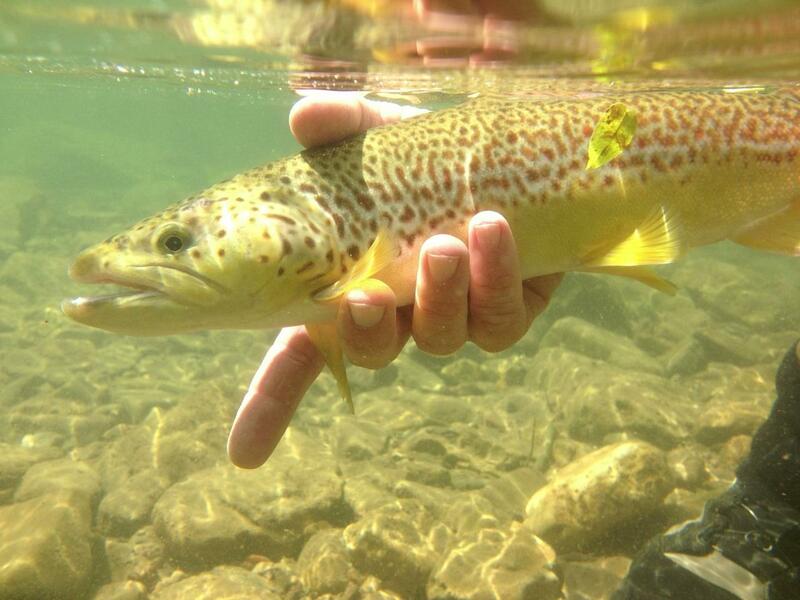 Also did well with a number of new patterns…the SoHo fish are eating them up….simple as that. The past few days if we got a good drift over the fish they ate it. Even on dead fkat water. You know a fly works when it works on flat water. Will be tying orders tomorrow, rescheduling a trip with David Carter that was set for tomorrow as the NC waters got pounded with rainfall. Will probably get out fishing for a couple hours myself. 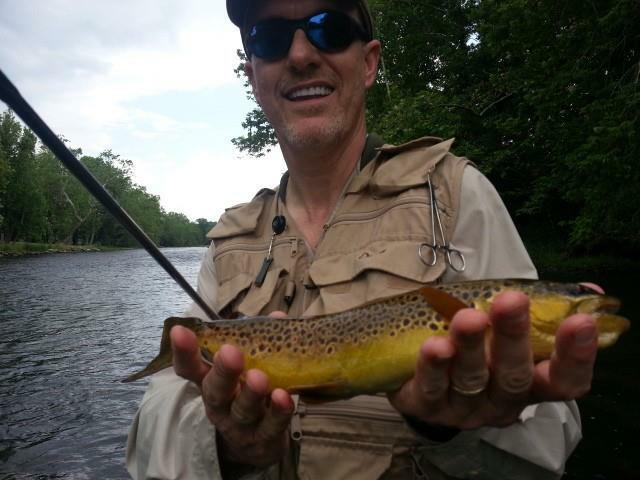 Phenomenal Day of Dry Fly Fishing…. Sat. 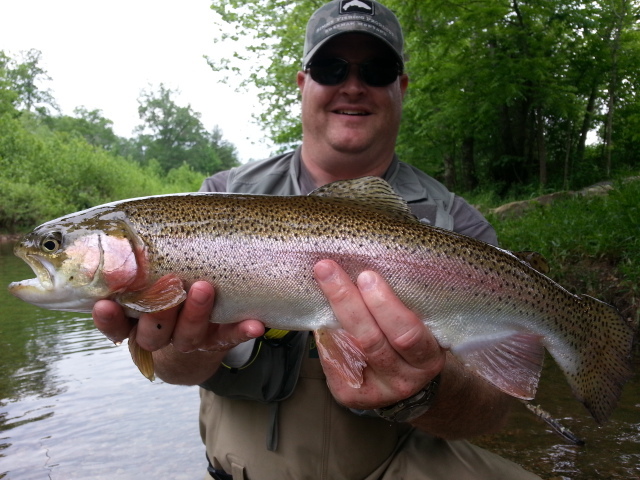 June 8, 2013…..What a great day, the first low water Sulphur hatch fishing in sometime on the SoHo. Guided Dr Jim Kramer and we had a knockout day. We started early and after several fish on midges the sulphurs started to pour off….and it was only 9am. They poured off for the next 5hrs and we fished to rising fish all day long. I don’t know for sure how many fish we landed but it was way over 50. At times it was downright insane. We caught several large and wild rainbows and browns. Water came up on us about 4pm so we moved downstream to another spot. Same scenario….rising fish and we put maybe 5 more in the net. This great fishing should continue for the rest of the summer. My June is almost full but July has openings. Let me show you this incredible fishery. Wed. June 5, 2013…After some excellent fishing over the weekend I have had the first two days of this week on the private waters of the Escatawba Farms . Guided Ryan Sexton of Charlotte, NC and he did well landing about 30-35 fish and a lot of them sight fishing with dry flies and other terrestrials. Ryan landed one fish toward the end that was 23-24" that took one of my inchworm patterns. Ryan landed that fish on 6X….we sight fished the huge fish and watched the fish eat the fly right before our eyes . Incredible. I did a second day on Tuesday guided Adam Harman and another excellent day . We landed 35-40 fish including rainbows, browns, brookies, smallmouth bass, largemouth bass….the dry fly fishing was off the charts. We nailed over 20 fish on top on size 8 dry flies. Yes a fly that looks like a mattress sitting on the water. Incredible. I posted some video clips , one of a violent dry fly take on one of those huge dry flies. Go to our main site www.appflyguide.com and to our fishing reports page. Just posted some great pics and videos.